I was intending on posting about something else this week, but I was in Chipotle a few days ago and I had an experience that was disgusting and left a bad taste in my mouth since. 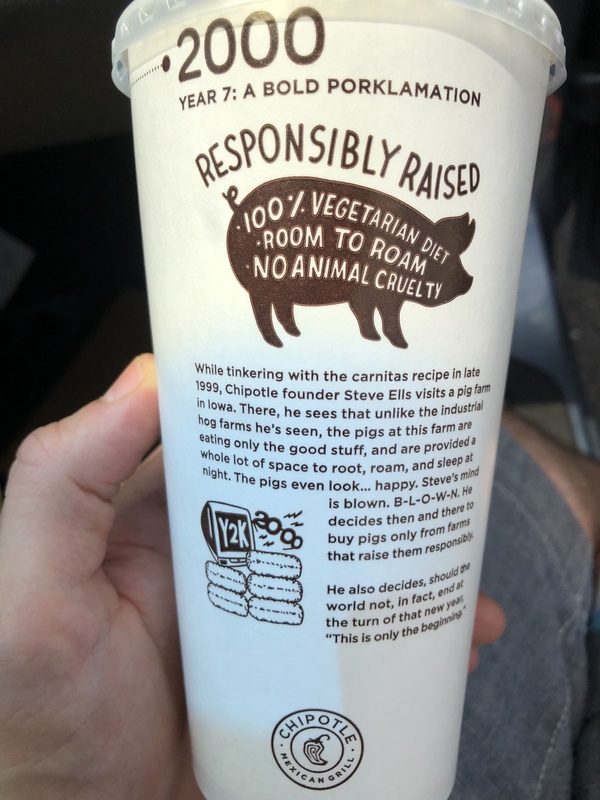 I was reading their cup which displayed their company timeline, and in 2000, the company began buying pork from pigs that were raised with room to “root and roam” and not given antibiotics (their website specifically refers to “subtherapeutic antibiotics”), which in itself is a disingenuous and misguided pursuit of being ethical while slaughtering animals. But that’s not even what affected me the most, below those meaningless words was the following: “No Animal Cruelty”. This is probably one of the most ridiculous and misrepresentative thing I’ve seen in a long time, probably ever. Cruelty free is never something that can be used to describe animal agriculture and the fact that they tried has some serious and upsetting implications. That made me angry and upset, because it deeply and unfortunately misunderstands two fundamental principles. First and most obviously, claiming there is no animal cruelty is just about as oxy-moronic as it is moronic. Words like “free-range” and “humane” are gimmicky, meaningless buzz-words, but even they are arguably more valid than claiming meat is cruelty free. It really is stupid to make such a claim. How can they declare their meat is free from cruelty? It is inherently cruel to harbor and harvest animals to see their meat, especially in a time when it is no longer necessary for the developed world. More importantly, who are they to even think something like that? The overseers and the people who carry out this practice of animal agriculture are in no place to even make such a repulsive and ignorant claim. The audacity this company is exhibiting by making such a false and ignorant statement about their meat is disconcerting, because they don’t just do it to make themselves feel like good corporate citizens, they also do it to make people feel good. The second principle is that this deceitful language only bolsters peoples’ consumption because they think the pigs were happy to be capitalized, held captive, slaughtered, and sold. Their cups and their website ignorantly boast that their pigs are happier and healthier that other pigs and the company is intentional about using pigs on farms with room to “root and roam”… Any degree of happiness or health these pigs have over others in factory farms, if even true, is negligible because they all share the same fate. And without knowing anything about their conditions, it’s a safe assumption it’s abhorrent and wrong. These pathetic appeals are a deceptive distraction from the reality that these animals are doomed to die for our food. This principle reflects something a very sad and ugly tendency about people. If they can find justification, then they will eat meat and dairy. If the words happy and healthy are there, then it’s okay to pay for the slaughter of those animals. If they can roam and root then it’s okay that we pay for their captivity and inevitable removal from those so-called good settings. It’s easy to refute this flawed logic: better than the worst still doesn’t mean it’s good; happier and healthier animals aren’t happy or healthy. No animal is happy in those settings and they are unhealthy for them. It’s an arbitrary standard that belies reality for the sake of our diets and attempts to justify the unnecessary and cruel capitalization, captivity, slaughter, and sale of innocent and defenseless animals. I will be contemplating ways to engage with the company to have this period on the timeline removed, or at least to have them remove “No Animal Cruelty”. I supposed they could always say “Less Animal Cruelty”, but the hypocrisy becomes obvious with that. The reality is, again, that cruelty is inherent in harboring and harvesting animals, the only cruelty free choice is veganism. Next Three Reasons: Who Are Your Vegan Idols?